Lansing Officer Wilson Pierce presents the Crosstown Classic trophy to the Memorial Jr. High girls basketball team. Lansing Officer Wilson Pierce takes photos and video at Lansing's annual Crosstown Classic basketball game. 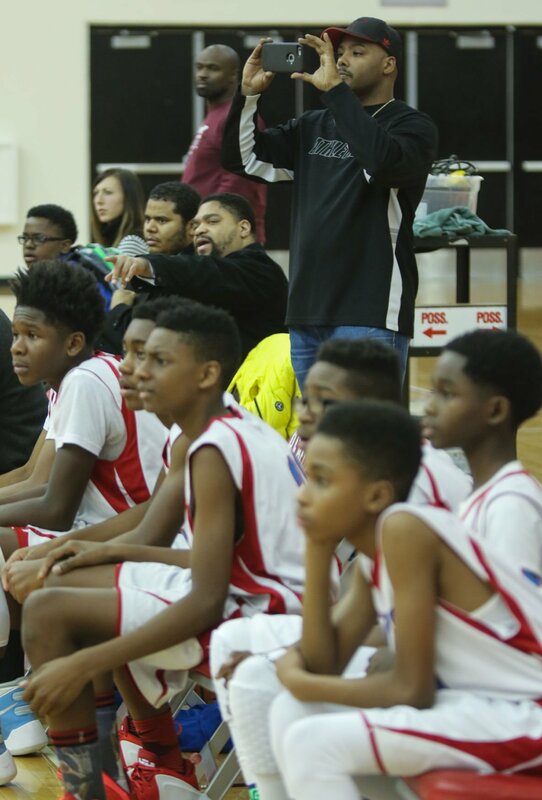 Memorial Jr. High boys basketball players watch as the girls team battles Heritage Middle School in Lansing's annual Crosstown Classic basketball game. Fans watch as Heritage Middle School and Memorial Jr. High girls battle for the Crosstown Classic basketball championship. LANSING — It was a much merrier Christmas than it would have been for many local children thanks to a nonprofit organization called Helping Our Minors Excel or HOME. Lansing Patrol Officer Wilson Pierce founded the organization in 2008 and he and fellow Lansing police officers took part recently in a second annual Shop With A Cop at the Lansing Walmart. With the help of school social workers, 50 students from Memorial Jr. High and Heritage Middle School were chosen to participate in the program. They were picked up in squad cars to spend $50 gift cards, half on themselves and half for someone else. Pierce said last year one boy decided to spend his whole allotment to buy his little sister a gift. "To see that, that's the spirit of giving," Pierce said. It was the spirit of giving back instilled in him by his parents that led Pierce, a 16-year veteran of the Lansing Police Department, to found HOME. The Thornwood High School grad and father of four was assigned as a juvenile detective at Thornton Fractional South High School at the time. He witnessed issues between students from Lansing's two middle schools. He said most Heritage kids come from Lynwood while all Memorial kids are from Lansing, and there would be animosity between the two groups simply due to their unfamiliarity with each other. "Memorial and Heritage never really interacted as far as with sports," Pierce said. The first HOME activity was called "Middle School Madness," in which 20 students from each middle school were brought together for an Olympic Day. "You had to learn to get to know each other and work with each other," Pierce said. "And that went over tremendously." That led to an annual Crosstown Classic basketball game between the two middle schools, the fifth installation of which took place recently at T.F. South. It brings together the eighth-grade boys and girls basketball teams in a friendly rivalry that involves a traveling trophy. Over the years, HOME has expanded into much more than just an avenue to unite the two middle schools. It began with Saturday morning tutoring sessions last year in which T.F. South students work with the younger children at the high school. HOME has also sponsored workshops, including one on bullying, and coordinates community service projects such as an annual "Pack the Pantry" drive in which students help stock the Lansing Food Pantry at Christmastime. HOME has sponsored an automotive class on Saturdays and is planning to start a television production workshop, likely to be held at the high school. "You get kids that come back and tell you, 'Because of you I changed,'" Pierce said. "You're not gonna save everybody, I mean, but if you can save that one person, it's worth it."